A list of the viruses we can and do detect in the (mostly upper) human respiratory tract. The standard testing panel/diagnostic menu comprises the influenza A and B viruses, parainfluenza viruses 1-3, respiratory syncytial virus, human metapneumovirus and the adenoviruses. I make no claims to there being a link between cause-and-detect here. Because these viruses are mostly detected using polymerase chain reaction-based methods (PCR, RT-PCR mostly in a real-time format), virus may be detected before, during or after a symptomatic period. Virus may also be found when there are no symptoms at all; an asymptomatic infection. In some instances the virus types included in this list are taken from a larger number of viruses grouped within a genus, for example the genus Enterovirus or the genus Mastadenovirus. My selection is based on our lab's multi-year, PCR-based studies since it can be hard to find decent data for a list like this using the scientific literature. Yes, I should write & publish faster, I know. 227 may well be an underestimate. For example viruses that may cause symptoms of gastroenteritis and central nervous system disease like the Saffold cardioviruses or the parechoviruses (HPeV) may begin their journey towards those diseases as a respiratory infections or involve the respiratory tract in the transmission process in some way. Other viruses including the newer polyomaviruses (WUPyV and KIPyV) are also detected in the airways but I have not listed them here. 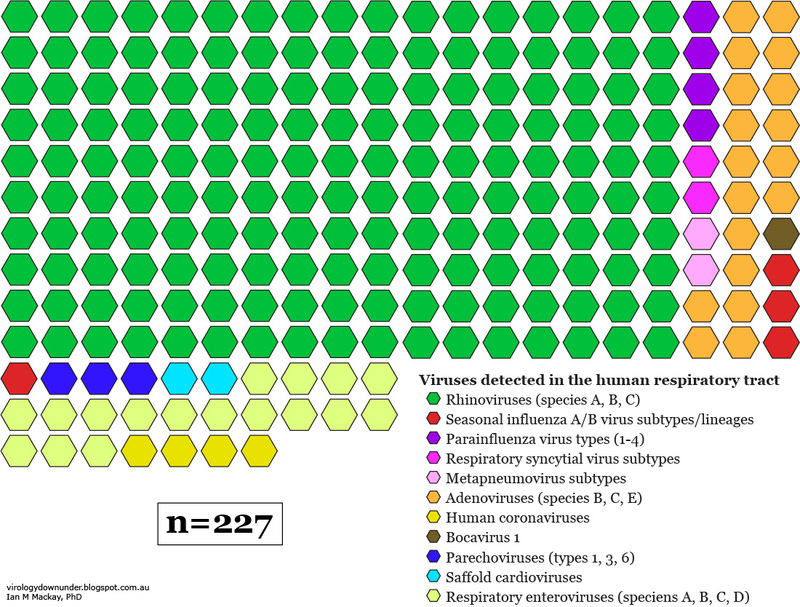 In short, take this figure as a guide, but a pretty good one, of the approximately 227 viruses that comprise the pool from which we get infected each year. Also keep in mind that most if not all viruses seem capable of being associated with a spectrum of clinical disease; from no symptoms at all (yes, even influenza) to mild and short-lived acute respiratory diseases (common colds), severe colds, bronchiolitis, wheeze in the absence of asthma, cough, sore throat, middle ear infection, pneumonia, exacerbating asthma and chronic obstructive pulmonary disease and preceding bacterial secondary infections. These viruses often circulate in seasons some of which overlap and some of which are exclusive. They can also co-occur in the same person at the same time, regardless of season. We can vaccinate against influenza virus; but it's worth remembering that a vaccine does not stop the virus entering our nose/throat. An effective immunization stops the severe form of the disease which can result from that infection. We may still test positive in a laboratory test after we have been vaccinated, but we are unlikely to be experiencing the full form of the disease (unless the vaccine did not "take" or there was a vaccine mismatch with the intended virus that we got infected by etc). Specific antiviral drugs among the respiratory viruses are rare; most infections are self-limiting (you recover from them yourself) and short-lived . Influenza virus is again an exception in that we have useful drugs to apply after we get infected. A specific monoclonal antibody treatment for respiratory syncytial virus (RSV) has also been successfully used for some years  and the broader acting ribavirin is licensed for use in humans . One question that is often posed when discussing testing for some/all of the list above is: why bother? If determining the virus won't lead to applying a treatment/cure and is of no use in prevention (if a patient is currently positive for that virus), then why expend time and money to sort it all out? Four very good reasons (from reference #4) plus some of mine (with some overlap), are listed below. These are the viruses that we interact with all the time; some more often than others at certain times of the year. Over a few years, we're likely to have fended them all off, or succumbed to the signs and symptoms of an infection by them, at one time or another. Great to have an immune system huh? Labels: adenovirus, bocavirus, coronavirus, human metapneumovirus, influenza virus, parainfluenzavirus, respiratory syncytial virus, respiratory viruses, rhinovirus, saffold virus, Why test? Google Flu Trends: What did you expect? Google Flu Trends: not so perfectly predictive?